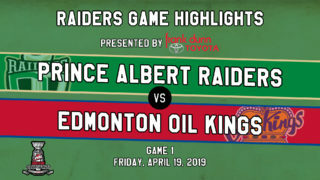 Prince Albert, SK – The playoffs are getting underway for Prince Albert Raiders prospects playing at the Midget AAA level across Western Canada. Here in Prince Albert, Austin Lamotte, Dylan Scriven and the Mintos will take on Cohner Saleski, Davin Griffin and the Saskatoon Contacts in the opening round of the SMAAAHL Playoffs. Lamotte was second in team scoring for the Mintos, finishing with 15 goals and 30 assists in 40 games played. Scriven scored seven times and added eight assists in his 32 games with the Mintos. For the Contacts, rookie Davin Griffin led his team in scoring with 17 goals and 18 assists in 39 games. Saleski finished the regular season with five goals and 10 assists in 24 contests. 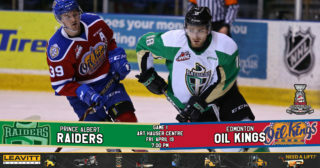 The series begins on Friday night at the Art Hauser Centre. Elsewhere in the province, a pair of captains square off as Adam Herold and the Regina Pat Canadians take on Aiden Bulych and the Yorkton Maulers in another first-round matchup. Herold was sixth on the team in scoring, scoring six goals and adding 24 assists for Regina. Bulych was second in scoring on the Maulers with 10 goals and 12 assists. That series opens on Saturday night in Regina. 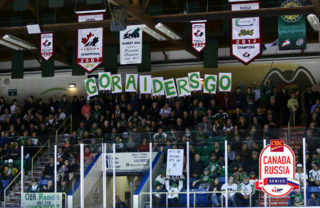 Rounding out the provincial matchups with Raiders prospects is a defenceman battle between Landon Kosior and the Tisdale Trojans taking on Mykllan Couture and the Swift Current Legionnaires. Kosior, who was named the Trojans’ Top Defenceman, scored four goals and added 16 assists in his rookie season. Couture had three goals and 12 assists this year, improving on both of those totals from last season. This series opens on Friday night in Tisdale. In Alberta, the AMHL Playoffs started earlier this week. Goaltender Brett Balas backstopped his Calgary Flames to a 2-1 Game 1 win over goaltender Sam Smith and the Calgary Northstars. Balas made 37 saves for the win. 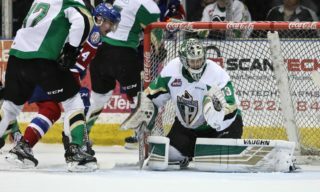 Balas posted a 3.11 goals-against average and a 0.905 save percentage in 19 appearances for the Flames. Smith finished the regular season with a 2.56 goals-against average and a 0.910 save percentage en route to an 11-4-2 record. That series continues tonight. Elsewhere, Ozzy Wiesblatt and the Calgary Buffaloes dropped the opening game of their series 1-0 on Tuesday night to the Calgary Royals. Wiesblatt was eighth in league scoring with 21 goals and 20 assists in 33 regular season games. This series also continues tonight. Braydon Clark and the Valley West Hawks have two games remaining in the regular season. Clark has a pair of goals and a pair of assists in 15 contests this season. Entering play on Thursday night, the Hawks lead the BCMML with a 27-4-2-1 record. The CSSHL will host their playoff tournament for both the Midget Prep division and the Elite 15s from March 11 to 16 in Penticton, BC.